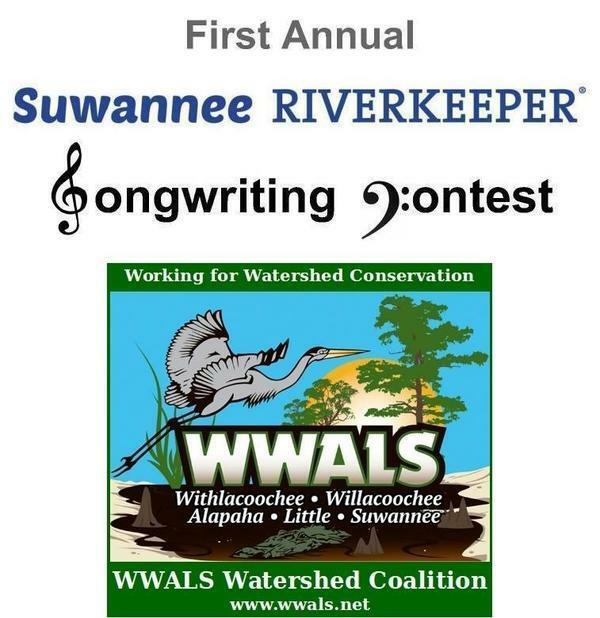 Calling all songwriters: today’s the deadline to submit for the Suwannee Riverkeeper Songwriting Contest. There is no age limit; songwriters so far range from 14 to 64. You can submit in any musical genre, so the committee can select seven finalists, and the judges can pick multiple winners. Prizes: $300 First Prize, $50 winner from within the Suwannee River Basin, $50 winner from elsewhere, and one winner in each musical genre. Finalists must be present to win. More: Follow this link for all the details. This entry was posted in Songwriting and tagged conservation, Florida, Georgia, north Florida, river, Songwriting, south Georgia, Suwannee Riverkeeper, watershed, WWALS, WWALS Watershed Coalition on May 13, 2018 by jsq.